Wish you all a very happy new year 2009. 2008 has been fun and we hope will be lot more fun with Kedaar. We went to a 5 week India trip on Nov 21st and just returned last week. 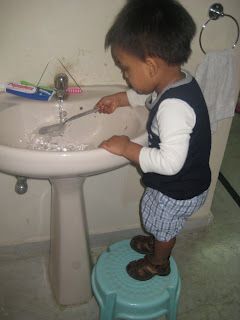 This is second India trip for Kedaar with the first being when he was 4 months old. 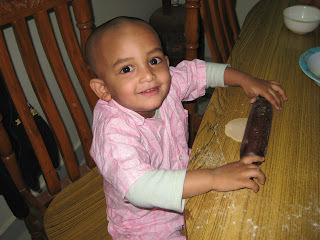 Kedaar thoroughly had fun during the trip with grand parents, cousins (rutwik, Sunny,Pavan,Padma), relatives. He quickly got adjusted in terms of activities, meeting people etc though he had some trouble with change of weather, milk initially.We also visited Tirupati this time.He talked to every one without fear and impressed them. He also started speaking more Telugu words, sentences than he did when he was in US. Some of the cute/interesting things about this trip. 2. Kedaar's top most interest in this trip was going in auto. Starting from the first day, he managed to sit in auto by himself. Irrespective of how many people were in the auto, he wanted space for himself without sitting in lap and would look at buses, other autos going on the road. Even in night sleep , he dreamt of "go auto". 3. Kedaar's next top interest was going up and down in the elevator that was just before the door in my parents apartment. His day started with "wear shoes" to "go elevator". He also exactly remembered the floor where my parents stayed in. My brother's son Rutwik,sister's son Suny taught him to do "balle balle" dance which he would do as a routine while he was in the elevator. 4. Some other fun activities he did are making chapathis, stand on stool before the wash basin and wash hands continuously,cleaning the house with broom, putting "muggu" before the house,helping grand mother with vegetables,sitting with grand father for "Puja" time,going for piggy back rides on every one,going on motor bikes,"go out" with every one who is ready by holding their hands nicely, watching melam (procession) from the apartment,"putting hands to take "Vaddu" in tirupati (Kedaar says "la" as "va", so he said "vaddu" for "laddus"),looking at buffalos and counting them,putting the clips used while drying clothes in different shapes,swinging by standing, sitting in wood easy chair. 5.Kedaar travelled in different types of transportation during this trip. 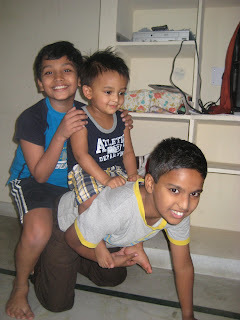 We went in train to Kurool (Kedaar always wanted to go into "choo choo train" whenever he saw Thomas train videos), returned from Kurnool in a bus, went to Tirupati in car, went on motor bikes with uncle and pedananna and finally went on autos almost daily. 6. Some Telugu words he uses very cutely these days during and after the India very cutely aer "Oka kshanam mummy","ayyayyayyooo","chichichicheee","sarigga" ,"pattaledu","battalu","thaggindi? ","cheyyi thiyyi mummy"etc.One more cute sentence he started speaking recently whenever he falls down or cannot get up etc is "I am falling doown, can you help me daddy/mummy". Here are some pictures from this trip.